Franck Montagny has been talking about his role as a Toyota F1 test driver and his life in general; he seems quite content and refuses to get involved with the speculation that he is being considered as a replacement for Ralf Schumacher in the racing team. I find that quite interesting as we always assume that test drivers are merely passing the time until they can get a race seat. Franck's attitude may be evidence of a new specialization developing within the sport. "My father was real crazy about motorsport, he was a rally man and my mother followed it all the time. I had no choice! My father was a car salesman and he also raced in amateur rallying. He did well, he raced well and I was always with him. When I was young I was always in the garage, with the tyres, the fuel and all that stuff from a very young age. "I was three or four years old when he was competing so I was too young to help but I went all the time with my mother. She would take care of me and the crew, they were basically his friends who went rallying with him." Quite a number of drivers in the past have had their appetite for competition nurtured by an interest in the workings of the car; Jack Brabham was always so involved with the mechanics that it was inevitable that he would start designing his own cars sooner or later, and Nelson Piquet was an important addition to the team that developed the Brabham BT49 into the race winner it became. So Franck is following on from a long line of drivers who have had more interest in the sport than just driving faster than anyone else. Such an interest is bound to make the driver a better test and development man than other drivers. It is said of Raikkonen that his weakness is that he just wants to arrive at the track, drive the car as fast as it will go, and then leave; which is fine as long as someone else is honing the car for you. But the driver who can work with the engineers and describe exactly what it is doing is more valuable to the engineers in helping them to decide how to get the best from the car. Franck is one of these, it would seem, so is Alex Wurz, and the Super Aguri team have great respect for Anthony Davidson's contribution to the development of their car. So it may be that we are seeing the rise of a new profession, that the role of test driver will become a respected specialism in its own right. There may be drivers in the future who are not all fired up to prove themselves the fastest in the world but have exceptional talents in reading a car's behavior and understanding what changes need to be made to improve it. And that is just as important as a gift for driving cars at the limit for lap after lap. It is often said that, to be champion, the driver needs to have "a killer instinct", that urgent need to be first regardless of whose ego gets crushed in the process. And there are those of whom it is hinted that they will never be the best because they lack the fierce competitiveness that wants to win at all costs. Is it coincidence that many of the drivers who know best how to set up a car are also the nicest guys in the pit lane? Perhaps they are really designed as test drivers but are following the dream of racing success because it's the done thing. Alex Wurz is a case in point. You cannot help but warm to his happy demeanor, his great grin and honesty; but he is under pressure now to improve his qualifying performance - he races well but too often has to start from near the back of the grid. Would he be happier to accept the role of test driver only and fulfill his dreams by being an important part of the team that creates a winning car? The designers, engineers and mechanics have satisfaction in just that manner; there is no reason why a dedicated test driver should not receive just as much respect and honor as a necessary part of the team. In the specific case of Alex Wurz, we know the answer already - he spent several years as a test driver, but returned to race driving because he didn't want to just be a test driver, however honoured and respected (and he certainly was at Williams, if not perhaps at McLaren). His dream is to race; testing was something he did to try to get himself back into a race seat. Even if he can't improve his qualifying, he won't settle for a test seat; he'll simply fight to get a third opportunity at F1 racing. In general, though, I think you're onto something. While it is not entirely true that nice drivers don't succeed at racing, a lot of the less aggressive drivers do seem to acquire a set-up talent in order to avoid using the "killer instinct" that they do not possess. It would not be sensible to put such a driver into an F1 race, since it would be patently obvious that they were in the wrong part of the sport. However, making testing a more respectable and desirable part of the profession would allow them to assume the role they are best suited to fulfilling. However, this means team bosses selecting their testers for testing talent specifically and not for racing skill, marketing opportunities and/or money as is currently the case. I'm not sure that we do know the answer as regards Alex yet; it may be that this second experience of F1 racing might make him reassess his reasons for the dream. For many drivers there comes a time when they have to face the fact that they will never be champion (which must always be the goal, surely). At that point, they have the option of continuing as the experienced half of a driving team, acting as a mentor to a rookie, for instance, or taking a test driver's job. David Coulthard has obviously opted for the first, but Alex may yet decide that he prefers the testing role. It depends very much on the team bosses as to whether they would be prepared to have a dedicated test driver, as you say. I can see some of them doing it, however - perhaps Frank Williams, who is renowned for caring about the car more than the driver. He might see the wisdom of having someone to test drive who knows everything there is to know about developing a car. I doubt any young karter starts off dreaming of being a test driver, but as in any walk of life, sometimes, some of us (most of us, once you strip out the delusional) realise that we haven't quite got what it takes to rise to the very top in an intensely competitive environment - and end up asking "well, I can't do that... so what is my niche"
I don't know about Alex Wurz, but Luca Badoer seems to fit this description perfectly. Made his debut in that horrid Lola Ferrari, back in 1993, and still earning a living as a tester nearly 2 decades on. Thank you, Patrick. 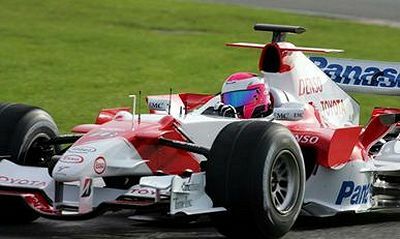 And a very good point about Badoer - he's been a test driver for Ferrari for as long as I can remember. Well, almost. I admit my memory does stretch back a little longer than that!